Budget Hotels > Travel Blog > Things to do > Best trekking places near Bangalore to fuel your adrenal rush!! Despite sore leg cramps and dehydration, if you are willing to go the extra mile on your trekking expeditions, we have some great new additions to your list of hills and mountains you should scale next. Be it the temples atop hills, night trekking to catch a beautiful sunrise or even views of the valley beyond, there are several trekking trails near Bangalore awaiting for the thrill-seeker in you. With trails from easy to difficult, you can opt for the one that suits your fitness level along with accessibility from your location. Pack that bag with litres of water, some healthy and energy-giving snacks, put on your hiking shoes and hit the road because this time the journey will be your destination. Located at a drive of just 2 hours from Bangalore, Savandurga is a renowned destination for every trekker of the city. Almost every link one clicks when searching for ‘trekking near Bangalore’, has this hike in the top 5 places and for good reasons. A calm and quiet destination right on the outskirts of the IT Capital of India provides the much-needed break a city-dweller years for once in a while. 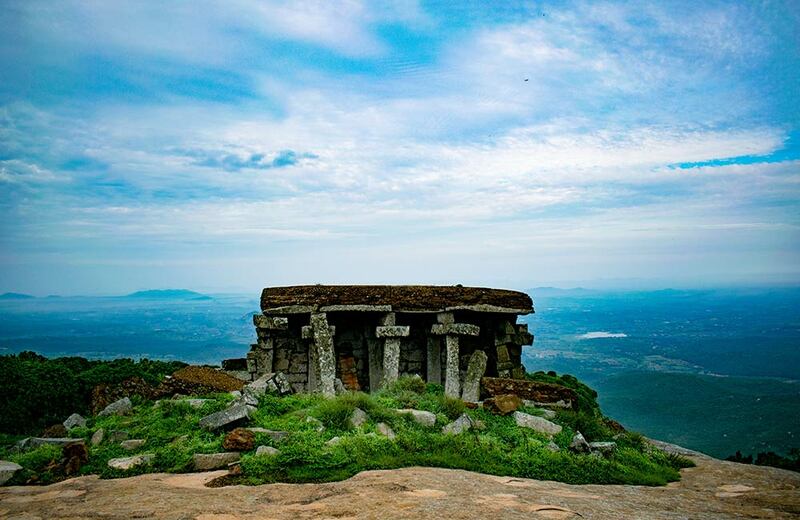 At 1227 metres, Savandurga holds the title of Asia’s largest monolith. From the base of the hill though, you will only be able to spot the top of the temple. The temple perched atop the hill is home to the carved statue of Nandi, Lord Shiva’s mount, the locals believe in and religiously pray to. 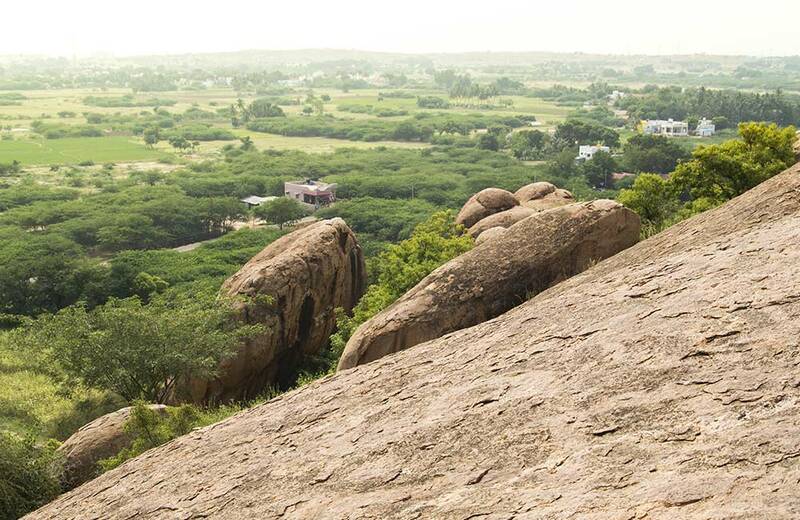 For all the adventure enthusiasts, hold your horses because there are two trekking trails to take you to top of the hill – Karigudda and Billigudda. The first one easier compared to the latter. So, based on your fitness levels, choose a trek that you can complete. The views from both the trails are breath-taking and people often stop for the sunset. We suggest you do too. Do not miss – The beautiful vistas of the surrounding town. This hill is also popular for night trekking in Bangalore. A part of the iconic Bollywood movie, Sholay was shot somewhere in the middle of these hills. If that doesn’t glorify the fame of these peaks, we have another piece of information for you. This weekend getaway from Bangalore is renowned for its silk trade as well, thus earning the title of ‘silk town’. With a number of short trekking trails dispersed around the district, you can opt for the ones that agree with your fitness levels. While Ramanagara itself is surrounded by seven humongous hills, the ones that offer scenic hiking trails for adventure enthusiasts are Revana Siddeshwara Betta and the Ramadevara. Plan your itinerary in advance if you want to make the most of your trip to this trekking place near Bangalore. Also, do not forget to visit the Pattabhi Rama Temple, located atop the Ramanagari Hill. Do not miss – Famous for a wide range of trekking trails. Ideal for bird watching and camping as well. 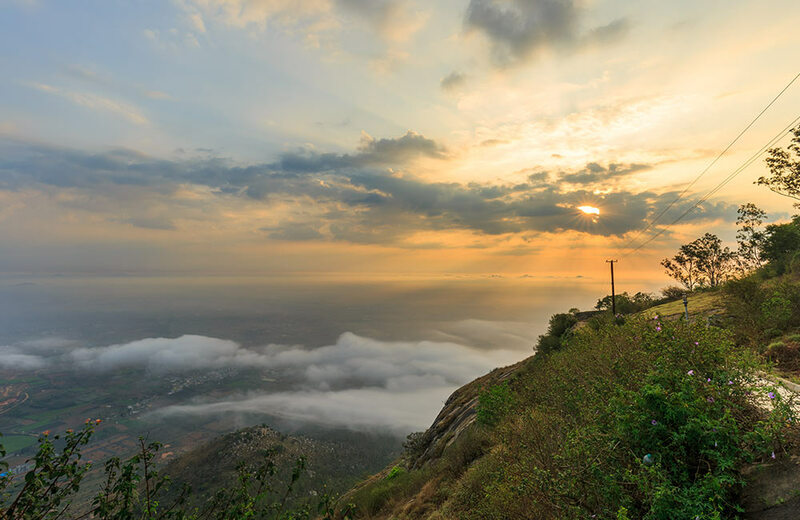 Nandi Hills is not only popular among trekking enthusiasts but it is famed as a weekend getaway from Bangalore itself. Back in the day, it used to be Tipu Sultan’s summer retreat and today it is swarmed by tourists or more aptly adventure enthusiasts who want to challenge themselves. You can either climb the 1200 steps to reach the top, or you can use the northern side of the hills if you want to go up there with your bike or cycle. From the top, you can click photos or just soak in the stunning view of the entire valley and Amrita Sarovar. Do not miss – Famous for adventure activities like trekking, hiking, rappelling and rock climbing. Offers breath-taking view of the sunrise from Tipu’s point, a rocky outcrop. Perched at an elevation of 1450 metre, Skandagiri is for the daring adventurers who are always looking for more action and adrenaline-pumping challenges. If you can handle a slightly difficult trek, instead of starting with Savandurga trekking, you can head straight to Skandagiri. A scenic destination close to Bangalore, this one is popular for activities like camping and bird watching. More often, the main motive behind people trekking to the top of the hill is the old fort. Once home to the famous ruler Tipu Sultan, today it lies in ruin but still has remnants of the past, enough to intrigue ardent lovers of history and architecture. As the trek usually takes around 5 hours, people often do it on the weekends and you should too. The trek starts from the Papagani Temple and sees an entire stretch of caves lining the temple as one moves forward. Do not miss – A breath-taking sunrise awaits you if you opt for night trekking in Bangalore. Unlike other destinations mentioned till now, this one is not a very popular trekking point. This is precisely the reason why you should take out time and go for an expedition to Narayangiri. 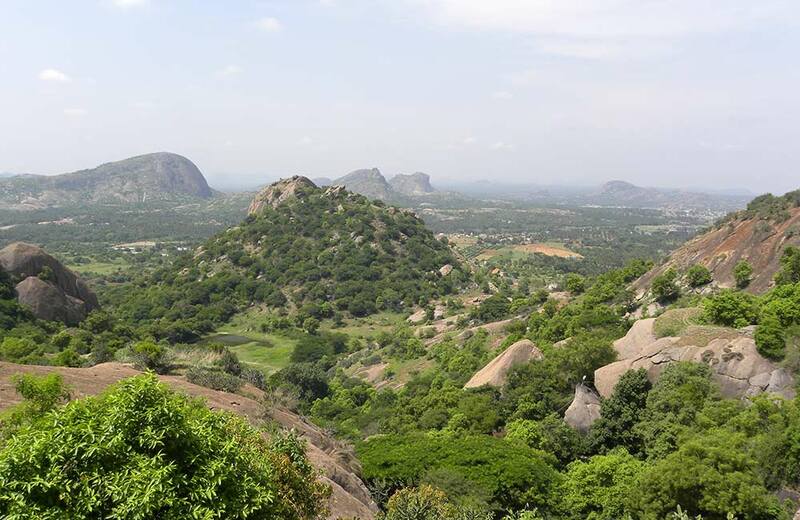 Located in the Ramanagara district, it offers a spectacular view of the seven hills and the entire town from the top. While the trek in itself is not that difficult, you have to be extremely cautious near the crevices as they can be slippery and deep. Do not miss – Night trekking in Bangalore couldn’t get better than this. The entire path to the top is not properly illuminated making it an exciting and thrilling experience. There are three levels to this hill. The first level is easiest and can be done by anyone, the second needs a little preparation and is for amateurs. Coming to the third level of the trek, only professionals or a person who has experience in trekking should go for it. That being said, the entire route to the top of this rocky hill (at an elevation of 1204 metres) will be worth it. Moreover, with plenty of natural springs along the entire route make for an excellent stopover in case you get exhausted. Do stop at the most famous natural water spring on the entire route – Namada Chilume. 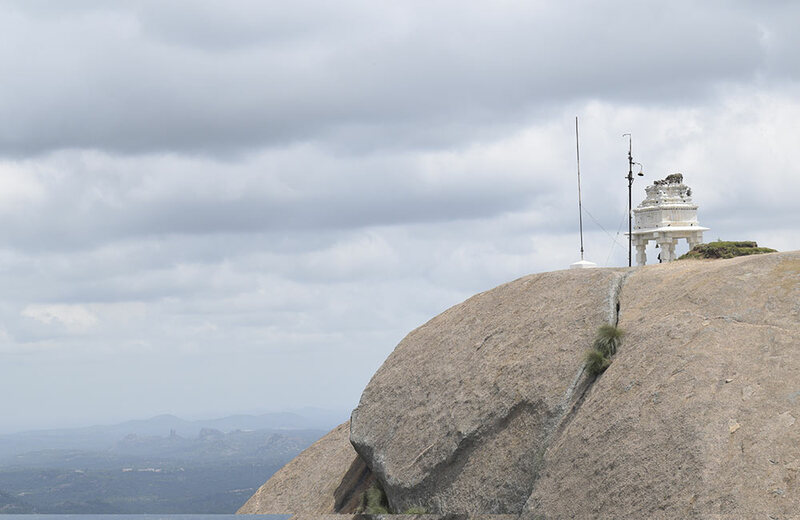 At the base of your trekking trail, there is Bhoga Narasimha temple and on the top, you will find the Yoga Narasimha temple, both religiously important for the locals. Amidst the temples and lush greenery of the hill, there is also a cave with statues of Lord Rama, Sita and Lakshman, which definitely merits a visit. Do not miss – Popular for its water springs and mesmerizing views, the caves witness a festival during the months of March and April. Rustic settings along with shrubs that have medicinal value pretty much define this popular and extremely beautiful trekking destination near Bangalore. Perched on a hilltop, Channarayana Durga has the Maratha Fort, built to ward off invasions by external forces. Today, it makes for an interesting spot to put your photography skills to test. The initial leg of this trail is pretty easy and there are no daunting turns or shocks. However, the latter part of the trek can get difficult and you are advised to take necessary caution. Once at the top of the hill, you can spend a couple of hours just soaking in the lush greenery all around or exploring the fort that has a deep significance and is rooted in history. Do not miss – The Maratha Fort is a popular attraction of the entire place. 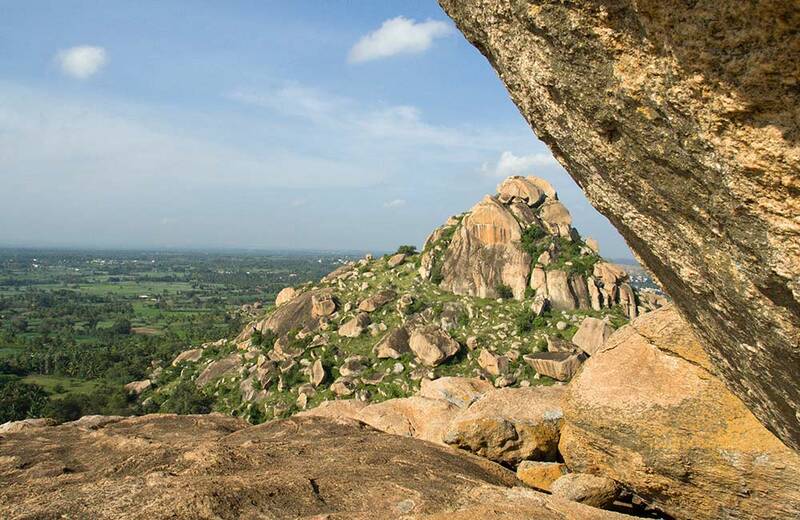 Home to the second-largest monolith in Karnataka, Madhugiri hill deserves a detailed brief as to why it should be on your lists of places to trek. Complete with forts, ruins and some stellar views of the surrounding areas, this trek will take only two hours. With steps built to the top of the hill, which is at an altitude of 1200 metres, you can trek or walk to the top at a leisurely pace. The name ‘Madhugiri’ was given to the place after it was infested with plenty of bee colonies back in the day. 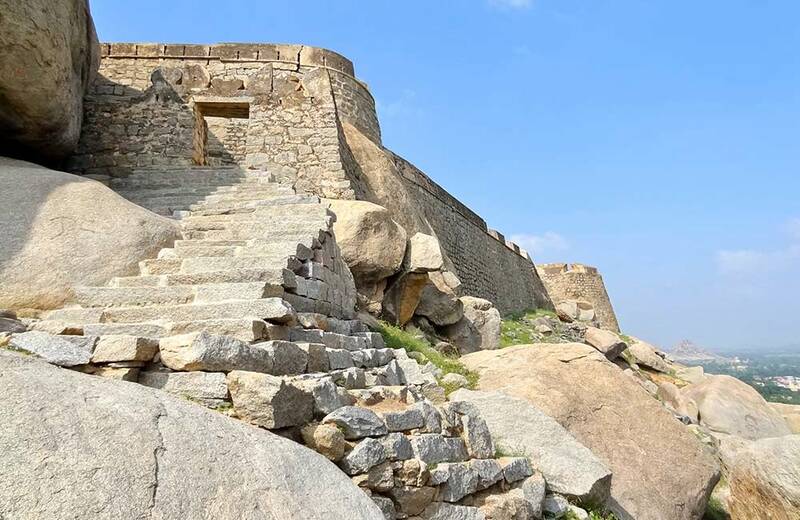 There is a Madhugiri Fort along the way which deserves a stopover. At the top of the hill, you can stop at the Gopalakrishna Temple, a beautiful sight despite being in ruins today. Do not miss – The history of Karnataka is better explored with a tour of the Fort and the temple at this hill. 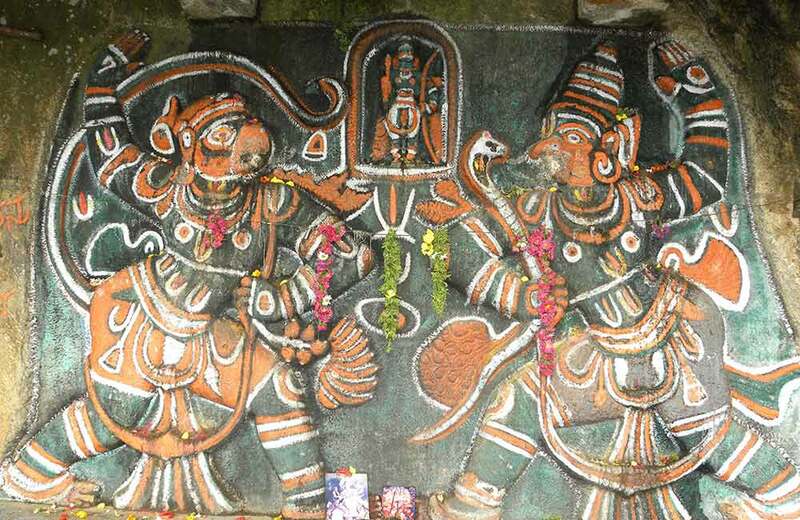 It is believed that the Pandavas spent a considerable amount of time of their exile here, thus the name Pandavapura. 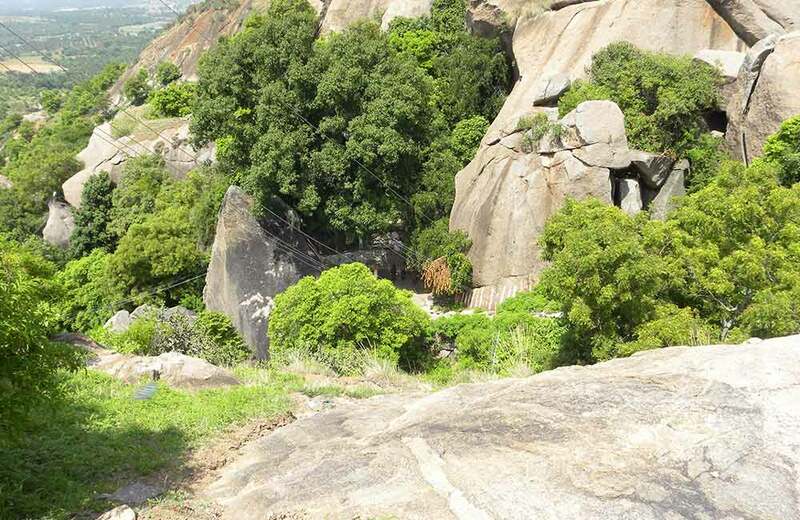 Having two rocky hills at an elevation of 854 metres, Kunti Betta is renowned for trekking events in Bangalore. Start your trek at night itself if you want to watch the sunrise, which is surreal according to the locals. The hills are surrounded by rocky outcrops, grasslands, lakes, paddy fields and forests, combining to give any trekker a view of their life. At the foothill, you will find a temple with a pond, and if you take this as your starting point for the trek, it will take approximately two hours to reach the top. For people looking for tranquillity, the Thonnur Lake is at a distance of just 4 km from the peak. Apart from being popular for night trekking in Bangalore, this place is a weekend destination from Mysore as well. Do not miss – Not only ideal for adventure enthusiasts but also perfect for nature lovers as the view of the Thonnur Lake from the top is simply magical. So if your initial idea about weekend getaways from Bangalore was only limited to Nandi Hills or Coorg, we hope to have expanded that viewpoint. Because Bangalore in itself is a place that yet needs to be explored, but when it comes to places close to the renowned city, there is no dearth of good locations. From offbeat destinations that are yet to see a touristy crowd to popular getaways known for night trekking, almost every location offers something unique and intriguing to the travellers ready to look beyond the ordinary. If you are travelling to the city, you’d be glad to know that these places would be quite easily accessible from your hotel in Bangalore. We suggest you only take on those treks that agree with your fitness levels because the idea is to enjoy the trek and come back with beautiful memories, not severe leg cramps. If you haven’t started preparing for your next trek near Bangalore, what are you waiting for?